Flush sash windows are a very exciting new development from Easyglaze. Many property owners require a traditional timber window frame, sometimes due to planning or environmental restrictions. Timber frames tend to be expensive, need regular maintenance and can be difficult to replace. We recognised the need to offer a casement window frame that would fit into any property where the sash fitted flush into the frame – and which could be foiled to look either like traditional timber or to offer a sleek, contemporary finish. Manufactured using Liniar’s Energy+ system our flush sash windows offer the realism of a traditional timber window combined with 21st century thermal benefits. This is achieved using a specially designed 50mm thick sash section that fits flush with the face of the outerframe. 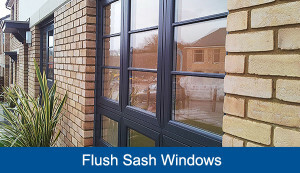 Unlike many other systems on the market Easyglaze’s flush sash measures 70mm front to back eliminating the need for cutting back plastered reveals where conventional casement windows are removed. They also offer a much lower cost window with higher thermal benefits than timber – in addition to being fully secure. Available in a sculptured profile with the flush finish on external faces, 28mm double or triple glazing easily achieving an A+ energy rating if required. Internally glazed with Yale’s shootbolt locking for fantastic secuirty with a wide choice of opening configurations. Available from stock in 9 different colours in just 10 days with many more colours available.